<>Question from Paul: There is a short track for the jib sheets but it is currently mounted on the deck. There is also evidence that these tracks were once fitted on the seat slats. Both the inner and the outer seat slats have holes for this track. Can you tell me which seat slat is better, the inner one or the outer one? From reading your guide it seems that the seat mounted track will enable the boat to point higher. We're talking about very marginal higher pointing with the seat-mounted track, so I wouldn't bother moving it unless you're planning to do serious racing. In fact, if I had to rig my boat for passenger comfort and racing, I would put my track and fairlead where you can see it near the bottom of http://www.wayfarerinternational.com/jibsheet.html and cut off the rest of the track since we have not moved our fairlead from that position in the last 20+ years and have done quite well with it there (see photo below). That would leave the decks and from seats available for comfortable sitting for passengers such as wives, etc. 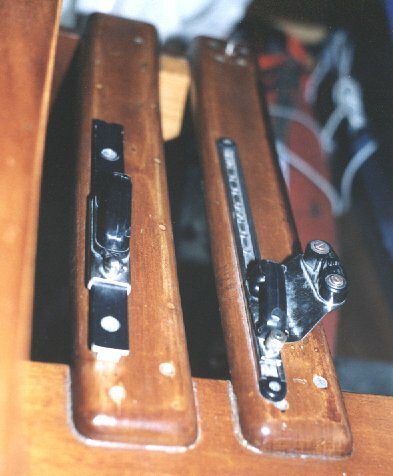 For the ultimate in cruising comfort, I would try to put a fixed lead-and-cleat arrangement on the very aft end of the outer front bench board, which would leave the front benches pretty much clear of seating impediments, yet give near 100% upwind performance. The one cleating key is to makes sure that your cleat is forced to angle up since there are few things more frustrating than trying to cleat the jib sheet, especially in a breeze, into a cleat that hangs over thin air and that very soon begins to angle downwards such that the jib sheet has to be cleated by moving right to leeward to force the sheet into the cleat. Let me know if more questions remain. Happy sailing in 2007! !